Mary Turner (Grace Henderson) and John Wintergreen (Alexander DuBois) get married for an old fashioned reason: love. 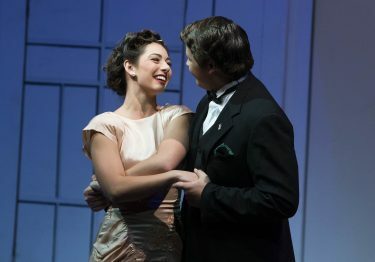 “Of Thee I Sing,” opening Friday night at Ethington Theatre, offers an energetic diversion from real life with a superbly acted political satire designed to keep you smiling, laughing and humming. 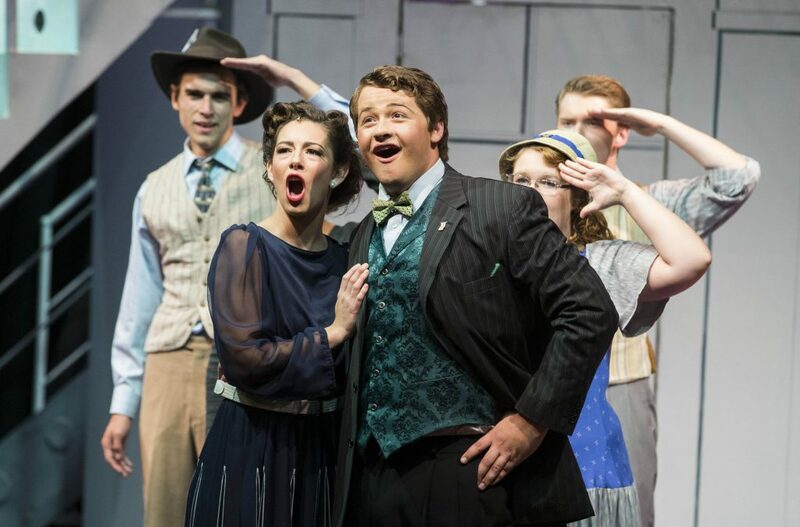 It’s a show filled with amusing one-liners, catchy tunes and memorable lyrics, a grand spectacle of entertainment that harkens back to a different time while conveying universal themes. It gives the audience a delightful reason to laugh at a fictional presidential campaign. Turner and Wintergreen are in love and in the White House. The delight comes in all forms, from the 1930s-era costumes, a stage filled with stars and stripes, humor ranging from subtle to slapstick, singing that is at once beautiful and hummable, and a cast full of actors who clearly enjoy the art of comedy. The show, first performed in 1931, won a Pulitzer Prize and is from a book by George Kaufman and Morrie Ryskind. The music is by George Gershwin, with lyrics by Ira Gershwin. The show opens with a musical overture and quickly leads into the action, which is raucous and funny. The scene is a hotel room filled with members of an unnamed political party who just nominated their presidential ticket. Poor Diana Deveraux (Devaune Bohall) won the beauty contest but not the president. The audience is taken back to a time when men wore hats and carried cigars, when they glad-handed one another and spoke, mostly in New York City accents, in quick witticisms. For example, when Alexander Throttlebottom appears in the hotel room, no one recognizes him. He insists that he is the vice presidential candidate. “Alexander, what is your first name?” one asks. “He’s got a mother?” another cracks. The jokes continue all the way through, some eliciting belly laughs, and a few have a bite. Candidate Wintergreen is supposed to choose a wife from this throng of beauties. For example, when we first meet presidential candidate John Wintergreen (Alexander Dubois), he immediately announces he is ready to do any dirty work. The men eat pickles and drink soda as they brainstorm a winning platform. “We’ve got to get something that will sweep the country!” one cries. “Our country could use a good sweeping!” responds another. Newspaper man Matthew Fulton (Gavin Harris) declares there will be a “love” headline every day in every newspaper. The singing and dancing is rousing and enhanced by the angelic soprano of Grace Henderson, who plays Mary Turner, the non-beauty contestant who wins Wintergreen’s heart with corn muffins. 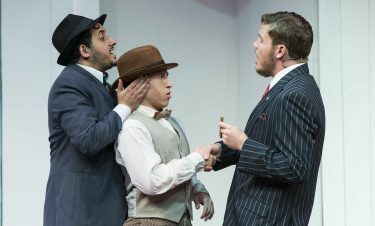 Alexander Throttlebottom (Levi Roberts), middle, is told by committee members that vice presidents are supposed to be invisible. Wintergreen was supposed to marry beauty contestant winner Diana Deveraux (Devaune Bohall). His choice of Mary Turner sparks an international incident with France that threatens to end diplomatic relations. Deveraux’s songs and acting provide laugh after laugh, as do those of the French ambassador (Andrew Dell). When he prances onto the stage in a red kerchief and black beret, he is accompanied by two French can-can dancers (Laynie Nelson and Anna Chasse) in over-the-top costumes with little Eiffel Tower replicas on their hats. 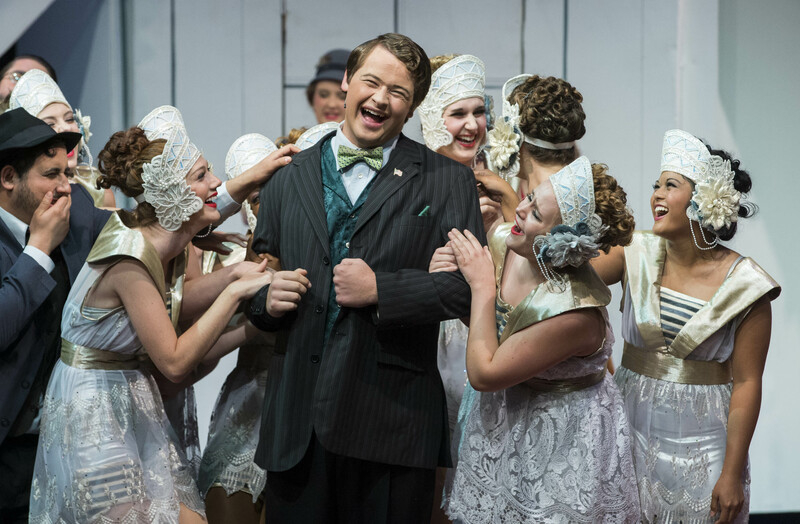 The singing, dancing and laughing political satire boasts a cast of 48, one of Ethington’s largest, and more than a handful are freshmen, Pensis said after the energetic spectacle. 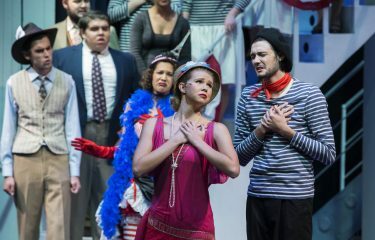 Other COFAP faculty and students involved in the show include William Symington, scenic designer and properties designer; Nola Yergin, costume designer; Stacee Martinez, sound designer; Mark Fearey, music director; Jessi Young, choreographer; Miranda Briscoe and Kaleb Burris, hair and makeup designers; and Klay Wandelear, technical director/master electrician. Tickets are available here, and students get tickets free with ID.